For some time now, Google’s search engine has been able to peer into mobile apps to find content within them. 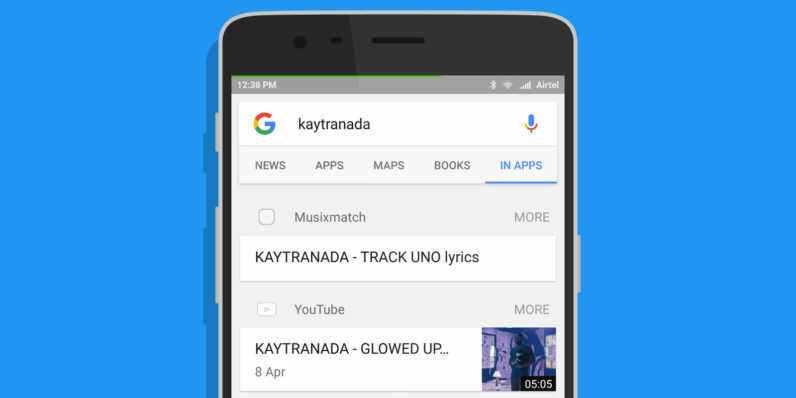 The company has now taken that feature a step further with its new search mode on Android. Fire up Google’s app or launch Google Now and enter a query, and you’ll find a new ‘In Apps’ tab above the results. This filters the results to only show you content from apps installed on your device, such as contacts, text messages and email, as well as songs from Spotify and videos from YouTube. Google says that the feature works entirely locally, so you don’t need a data or Wi-Fi connection to use it – and your results won’t be beamed to the cloud. Plus, you can exclude certain apps from this search mode by heading into the settings and finding them in the ‘In Apps’ menu. In addition to the apps that this feature currently supports, Google will also soon add Facebook Messenger, LinkedIn, Evernote, Glide, Todoist and Google Keep to the list. The company notes that the upcoming Android 7.0 Nougat-based LG V20 handset, with its second screen, will have a dedicated shortcut to take advantage of In Apps search; the feature will also work with LG’s pre-loaded apps. The feature appears to be live across the globe now. There’s no word yet on whether it will arrive for iOS devices; we’ve contacted Google to learn more and will update this post if there’s a response.